Jean Sibelius (1865–1957) loved the violin. His ambition had originally been to become a violinist, but his compositional skill soon exceeded his instrumental abilities. His hugely successful Violin Concerto has tended to draw attention from his other string works, of which there is a surprisingly substantial amount. 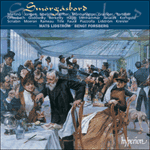 For financial expediency, Sibelius composed many short pieces for the instrument during the First World War (orchestras struggled, as musicians were called to the front). However, these inventive miniatures are sadly neglected nowadays. The Five Pieces for violin and piano, Op 81 were composed between 1915 and 1918 and while published as a set, each can stand on its own. The music does not reflect the tragedy of war at any point and like similar occasional pieces written by Kreisler, each has an abundance of charm and melodic invention. The Mazurka (written first, in 1915) is the most demanding technically, opening in a cadenza-like manner and replete with huge leaps in the melody, with much double stopping and other virtuoso effects. The Rondino dates from 1917 and is written in a quasi-Rococo style. 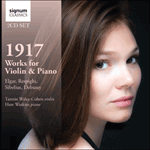 The Valse (also 1917) is languorous and beguiling with a most inventive middle section. It has a similar flavour to Elgar’s Chanson du Matin. Aubade (composed 1918—the title means ‘morning song’) has a Mozartian delicacy about it, with a lovely singing melody supported by the busy piano figuration. Finally, the Menuetto (also 1918) is by no means a pastiche of an 18th-century dance but a genuine attempt to evoke the classical period, its vigorous use of the trill providing a vibrant, masculine flavour.